Home / Business & Investment News / Is silver a better bet than gold in the near future? Last week, the beginning of April 18th, 2016, silver was on fire, rising sharply and forcing ‘Wall Street’ to take note of its move, though, many investors believe that gold and silver are one and the same, one can hold either in your portfolio and earn the same returns? the truth is far from that! In reality, though both silver and gold are considered precious metals and over the long-term, they have a high degree of ‘correlation’ in their movements, but in the short-term, for the active investor, both offer opportunities at different times. From the chart below, it is clear that once the bull market starts in precious metals, silver beats gold hands down. From 2005 to the highs in 2011, gold returned an impressive 350% returns, whereas, for the same period, silver recorded an astounding 700% return. My subscribers are aware that we are extremely bullish on the precious metals over the next few years when the global economies enter ‘The Great Financial Reset’. Gold will be in a sustained bull market for years to come and will reach levels which now seem unbelievable. 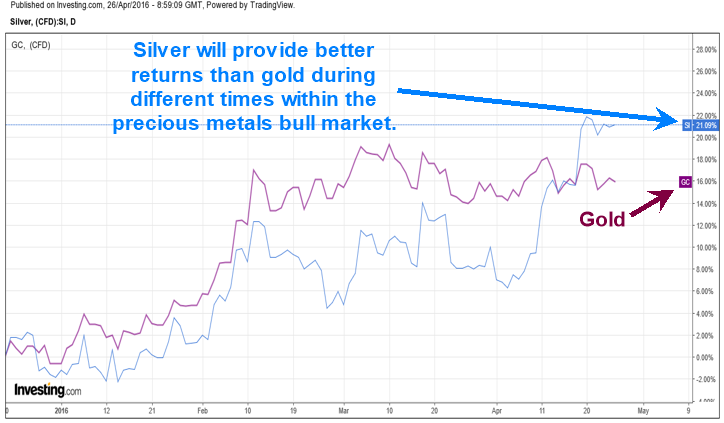 History suggests that if gold witnesses a resounding bull market, silver will outperform it. However, occasionally, investors will benefit if they trade in and out of both these markets. At times, holding silver is more profitable than gold and at other times, it is the other way around. Consider this, if one would have bought gold, during the start of this year of 2016, one would have made an impressive 16% returns in the first two months’ as shown in the chart below. However, silver would have returned a 12% return for the same two-month period. Since then, I raised a ‘red flag’ regarding a short-term top developing in gold and gold prices have been range-bound with a downward bias. On the other hand, silver has taken off, on April 18th, 2016, netting an investor a 16% gain in this month, which beats most other asset classes, including gold. Today, ‘Commercial Traders’, as determined by their large position, which we have not been this bearish on silver since 2008. This is when silver traded from $21 per ounce all the way down to $8 just before silver had a multi-year rally topping in 2011. They set a new record short position last week! In a couple days, I will be posting the second half of this article here on this website to show you what exactly is likely to happen and when for both gold and silver. Trading and investing is not as simple a most think it is. Just because you or someone you follow is bullish on an investment does not mean it is a good buy or should be bought. Timing is everything in the markets and knowing when and where to buy and sell is the key to long-term success. The big question you should be asking yourself is if precious metals are headed lower? This I will share with you in a couple days, stay tuned. The post Is silver a better bet than gold in the near future? appeared first on ETF Forecasts, Swing Trades & Long Term Investing Signals.